What Does a Modern Chimney Look Like? See photos of 7 modern chimney styles, and learn how new home chimneys are different than you might expect. Why do some fireplaces require a full chimney while other only need a small vent? Where do most floor plans place the chimney? 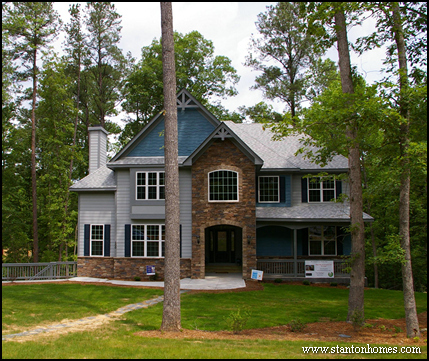 This new Stanton Home in Apex features a framed chimney box directly above the two-sided interior gas fireplace. 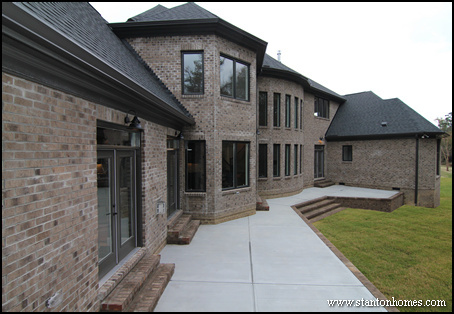 Compare this framed vent - located on the front of this home - to a more standard vent in The Avonstone Manor, pictured below. 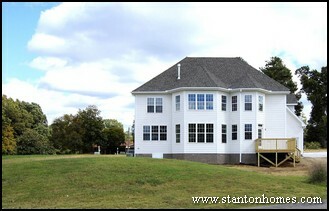 This version of The Avonstone Manor features a standard gas fireplace vent, located on the back side of the home. This new home fireplace vent is small and unobtrusive. Look above the rounded great room wall (with two stories of windows), and you'll see the silver pipe vent. On this version of The Penelope, an exterior wall hosts the woodburning framed chimney. This modern chimney is a typical venting "box" on the outside of the house. This vent is the same width as the wood burning fireplace, with height proportional to the roofline. A framed chimney lines the rear wall on this version of The Chalet Vert. This chimney vents the two story wood burning fireplace inside the great room. 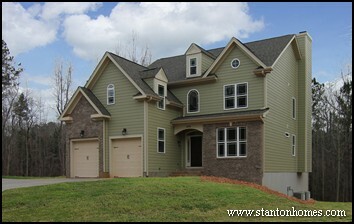 Because the fireplace is flush against the rear wall, you can see the chimney box follow the entire height of the home. Why is the gas fireplace vent on the back side of this home - a version of The Kelley - much taller? Fireplace vents must stretch two feet taller than anything within a ten foot radius. 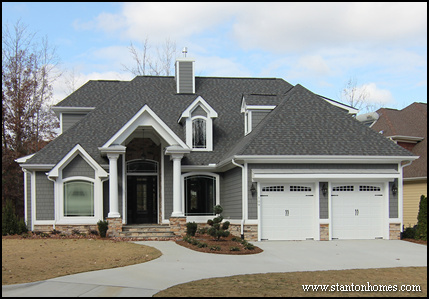 If your roofline is complex with tall pitches, your fireplace vent will follow suit. While gas fireplaces can vent out the side of your home, wood burning fireplaces must vent through the roof. This gas fireplace home - a version of The Thurman - features a small box on one side, which serves as the fireplace vent. 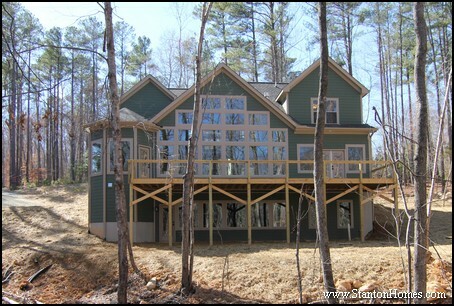 This home - a version of The Bostwick - requires a side chimney for the wood burning fireplace to vent through the roof. 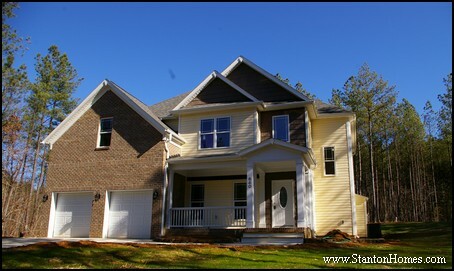 Traditional masonry fireplaces and chimneys have become extremely rare in Raleigh new home construction. 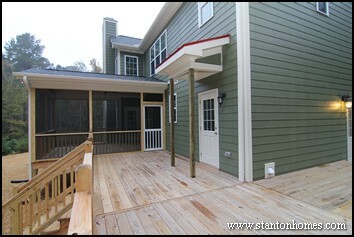 The seven examples above represent most of typical modern home construction. If you're curious about how your fireplace venting will look from the outside of your home, ask your builder for a full description or rendering. Your home builder can tell you all about the placement, size, and composition of the venting and chimney required for the exact fireplace(s) in your floor plan.